Imogen's Typewriter. 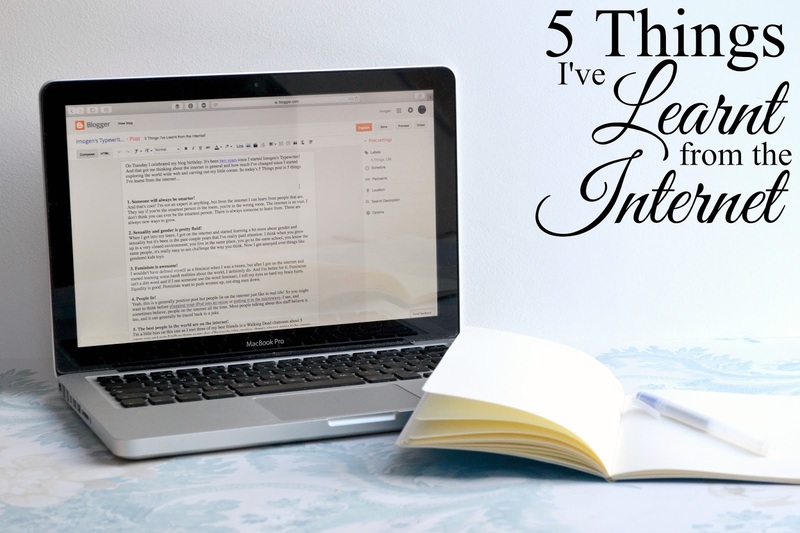 : 5 Things I've Learnt from the Internet! 1. Someone will always be smarter! And that's cool! I'm not an expert in anything, but from the internet I can learn from people that are. They say if you're the smartest person in the room, you're in the wrong room. The internet is so vast, I don't think you can ever be the smartest person. There is always someone to learn from. There are always new ways to grow. 2. Sexuality and gender is pretty fluid! When I got into my teens, I got on the internet and started learning a bit more about gender and sexuality but it's been in the past couple years that I've really paid attention. I think when you grow up in a very closed environment; you live in the same place, you go to the same school, you know the same people, it's really easy to not challenge the way you think. Now I get irritated by things like gendered kids toys, don't even get me started on more serious issues. I wouldn't have defined myself as a feminist when I was a tween, but after I got on the internet and started learning some harsh realities about the world, I definitely do. And I'm better for it. Feminism isn't a dirty word and if I see someone use the word feminazi, I roll my eyes so hard my brain hurts. Equality is good. Feminists want to push women up, not drag men down. Yeah, this is a generally positive post but people lie on the internet, just like in real life! So you might want to think before plugging your iPod into an onion or putting it in the microwave. I see, and sometimes believe, people on the internet all the time. Most people talking about this stuff believe it too, and it can generally be traced back to a joke. 5. The best people in the world are on the internet! I'm a little bias on this one as I met three of my best friends in a Walking Dead chatroom about 5 years ago and now I talk to them every day. Obviously take caution, there's always going to be creeps and weirdos, but if you're lucky- some of those weirdos might end up being your best friends and a huge part of your life. What have you learnt from the internet?